Screenshot of a Munchos commercial. 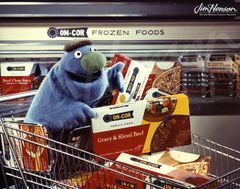 Before Sesame Street, Jim Henson made multiple commercials for various companies from 1962 to 1969, using his trademark Muppets as spokespeople. Before that, he made multiple commercials featuring his other Muppet characters, Wilkins and Wontkins. Some of these commercials were direct remakes of Wilkins and Wontkins commercials. These commercials included brand new characters, such as Skoop and Skip. While many of these commercials can easily be found on YouTube, others such as the ones for On-Cor Frozen Foods, are lost. Image of one of the commercials. On-Cor Frozen Foods is a frozen food brand that makes stuff such as meats and pasta. Three commercials were made in 1962, featuring the muppet Onky. None of the commercials have surfaced online, and it is unknown if they will ever surface. Purina PetCare is a company that specializes in dog food. Seven commercials were produced from 1962 to 1963, and 4 were released as bonus features on The Muppet Show: Season Three DVD box set. These commercials are notable for being the debut of the ever-popular Muppet, Rowlf the Dog. 4 Purina Dog Chow commercials. Doña Lola, a Muppet that appeared in the commercials. Chase Manhattan Bank was a national bank in Puerto Rico, which was a merger between Chase National Bank, and The Manhattan Company. Eight 20-second commercials were produced in 1963. 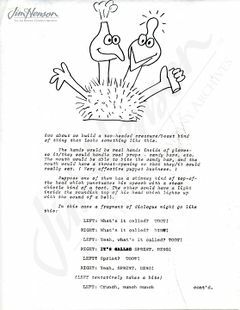 According to Jim's Red Book, the commercials were in Spanish, so the puppeteers had to lip-sync to a Spanish audio track. While it is currently unconfirmed, it is possible that one of these ads was uploaded to the official Jim Henson Company Twitter page. Marathon Oil is an oil exploration and production company headquartered in Texas. Jim Henson made a commercial for Marathon Oil in 1963 featuring two singing gasoline pumps. Two versions of this commercial are known to be made; a 60-second version and a 20-second version. The 60-second Marathon Oil ad. Behind the Scenes image for one of the commercials. The Federal Housing Administration (FHA for short) is a United States government agency made to improve house standards. 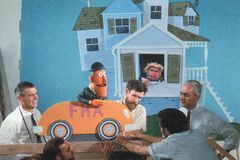 Jim Henson produced nine commercials for the FHA between 1963 and 1969. Out of these, only six have made their way onto the internet. Ad for the FHA (1/6). Ad for the FHA (2/6). Ad for the FDA (3/6). Ad for the FHA (4/6). Ad for the FHA (5/6). Ad for the FHA (6/6). Claussen's Bakery is a historical bakery built in 1928. Jim Henson made twenty-four commercials for Claussen's Bakery from 1964 to 1966. These commercials featured an early version of Kermit the Frog, as well as a new Muppet named Mack. Most of these commercials were direct remakes of Wilkins and Wontkins commercials. Out of these commercials, only three can be found online. Ad for Claussen's Bakery (1/3). Ad for Claussen's Bakery (2/3). Ad for Claussen's Bakery (3/3). Cloverland Dairy is a company that produces dairy products. In 1965, Jim Henson made three versions of one Cloverland Dairy commercial; one 10-second ad, one 20-second ad, and one 1-minute ad. This commercial featured a cow dancing over a farm singing a jingle about Cloverland Dairy. Out of all of these commercials, only the 1-minute version can be found. The 1-minute ad for Cloverland Dairy. Aurora Bath Tissue was a brand of toilet paper made by the American Can Company. Starting in 1965, Jim Henson made commercials for Aurora Bath Tissue, which starred a fancy glove dancing on top of the product. It is currently unknown how many commercials Jim Henson made, but two commercials can be found on YouTube. Ad for Aurora Bath Tissue (1/2). Ad for Aurora Bath Tissue (2/2). C & P Telephone Co. was a brand name for four Operating Bell Companies. Jim Henson made ten 10-second ads for C & P Telephone Co. from 1964 to 1965. These commercials featured a girl muppet named Suzy and Mack (who was previously used for Claussen's Bakery). Out of these commercials, only three can be found. Ad for C & P Telephone Co. (1/3). Ad for C & P Telephone Co. (2/3). Ad for C & P Telephone Co. (3/3). La Choy is a brand name for canned Chinese food. 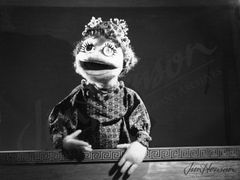 From 1965 to 1967, Jim Henson produced 11 ads for La Choy. These commercials included a spokesperson named Mert and a dragon named Delbert the La Choy Dragon. Some commercials included a hand puppet version of Delbert, who would both promote the product, while others included a full-body puppet of Delbert. Out of these eleven commercials, only 6 have made their way online. Ad for La Choy (1/6). Ad for La Choy (2/6). Ad for La Choy (3/6). Ad for La Choy (4/6). Ad for La Choy (5/6). Ad for La Choy (6/6). From 1965 to 1968, Jim Henson made eleven 10-second ads for McGarry's Sausage. These commercials included Mack and Kermit (much like the Claussen's Bakery ads). Thirty scripts for ads were written, but only eleven were filmed. Out of these, only one can be found. From 1965 to 1966, Jim Henson made eight 10-second ads for Southern Bakeries. These commercials were promoted by a southern colonel muppet, who would do just about anything for Southern Bread. Three of the eight ads can be found online. Ad for Southern Bread (1/3). Ad for Southern Bread (2/3). Ad for Southern Bread (3/3). From 1965 to 1967, Jim Henson created twenty-four ads for Wilson's Meats. These commercials included two muppets who were similar to that of Wilkins and Wontkins, Scoop and Skip. Out of these commercials, only 4 have made their way online. Ad for Wilson's Meats (1/4). Ad for Wilson's Meats (2/4). Ad for Wilson's Meats (3/4). Ad for Wilson's Meats (4/4). 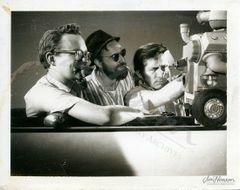 Behind the Scenes photo of the commercial, featuring Jerry Juhl, Jerry Nelson, and Don Sahlin. In 1966, Jim Henson created one 1-minute commercial for American Oil/Standard Oil, which featured two robots named Charlie and Clyde. No videos of this ad have surfaced, the only proof being concept art, and a behind the scenes photo. Kern's Bakery is a bread bakery based in Tennessee. From 1965 to 1966, Jim Henson made twenty-four 10-second ads for Kern's Bakery. These commercials were hosted by two muppets named Tommy and Fred. Four of the twenty-four commercials can be found on YouTube. Ad for Kern's Bakery (1/4). Ad for Kern's Bakery (2/4). Ad for Kern's Bakery (3/4). Ad for Kern's Bakery (4/4). Royal Crown Cola (commonly known as RC Cola) is a cola-flavored soft drink. In 1966, Jim Henson created four 20-second commercials for Royal Crown Cola. These commercials featured two birds; the Nutty Bird and the Sour Bird. The Nutty Bird would eventually become Big Bird, of Sesame Street fame. Most of these commercials can be found online, three out of four of them being found. Ad for Royal Crown Cola (1/3). Two ads for Royal Crown Cola (2/3, 3/3). Southern Bell Telephone was a Florida-based Bell Operating company. From 1966 to 1968, Jim Henson produced five 10-second ads for Southern Bell Telephone. These commercials included two muppets named Mack and Suzy, who also appeared in commercials for C & P Telephone Co.. Only one of these five ads can be found on YouTube. Ad for Southern Bell Telephone. Wheels, Flutes & Crowns were a line of snack food by General Foods Canada. In 1966, Jim Henson produced a commercial for these snacks, however, the commercial went unaired. This commercial is notable for being the official debut of the ever-popular muppet, Cookie Monster. The ad can easily be found on YouTube. The ad for Wheels, Flutes & Crowns. In 1967, Jim Henson made four commercials for the product Linit Fabric Finish. These commercials were hosted by a spray can knight named Sir Linit. Some shots included him as a marionette, and some included him like a hand puppet. Only one out of the four commercials can be found. An ad for Linit Fabric Finish. Tastee-Freez is an ice-cream company founded in 1950. In 1967, Jim Henson produced two commercials for Tastee-Freez; a 1-minute ad and a 10-second ad. These included a boss and his helper Homer. Only the 10-second ad has surfaced. The 10-second ad for Tastee-Freez. Kenner Products was an American toy company. In 1968, Jim Henson produced commercials for Kenner's Easy-Bake Oven. These commercials included a girl and the Kenner Bird, who would eventually become Little Bird on Sesame Street. While it is currently unknown how many commercials were made, one of them can be found on YouTube. An ad for Kenner's Easy-Bake Oven. Design for a lion muppet, who appeared in the commercial. In 1968, Jim Henson created a commercial for Monarch Margarine. This commercial included an old lady muppet named Mrs. H, and a lion muppet. No videos have surfaced of this commercial, however, color storyboards are known to exist. Munchos are a potato snack made by Frito-Lay. 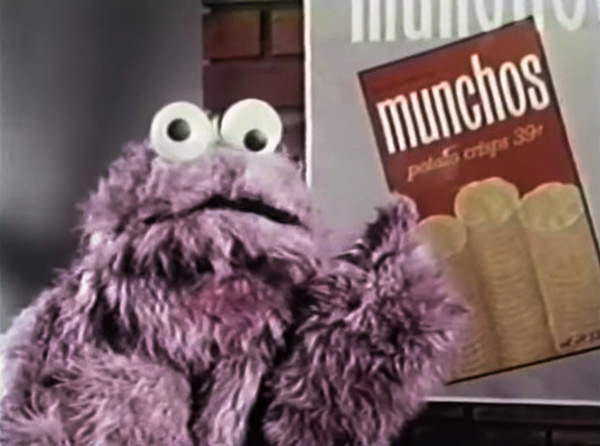 In 1969, Jim Henson produced three commercials for Munchos. These commercials included a spokesperson named Fred, and a monster named Arnold. Arnold would eventually become Cookie Monster. Only two out of the three ads can be found. Part of the script for the original version of the commercial. 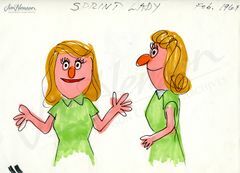 Concept art for the humanoid muppet. Sprint was a line of candy bars manufactured by Mars. In 1969, Jim Henson made a commercial for Sprint Chocolate Wafers. The original commercial would've used a two-headed creature, while the final version used humanoid muppets. No videos have surfaced of this commercial, however, concept art can be found.